Since 2006 mosaic artist Kate Anderson has opened her studio at Tongland to the many visitors who come to explore the work venues of artists in Galloway during Spring Fling Open Studios. As the only artist working in the medium of mosaic visitors can experience Kate's ongoing work for commission and exhibition, alongside the diversity of materials and techniques she uses. Kate is also a co-ordinator for the British Association for Modern Mosaic, which is holding its annual forum in Edinburgh for the first time since it was founded eighteen years ago. The two day Forum entitled, 'Mosaic: A Celebration of Design, Expression and Colour', will take place at the University of Edinburgh and Edinburgh College of Art on September 30th and October 1st. 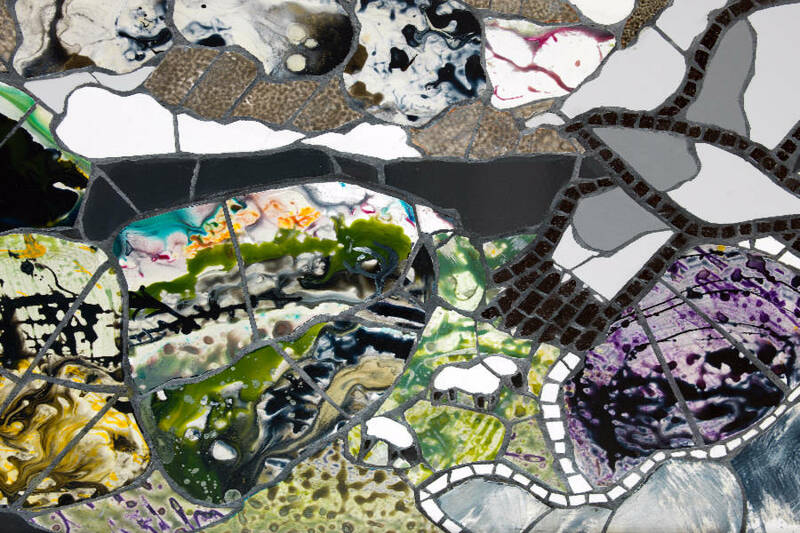 "The University of Edinburgh is custodian of the fragments of the iconic Eduardo Paollozi archway mosaic, which was salvaged during the upgrading of London's Tottenham Court Road Tube Station, and we are celebrating these and the wonderful Modern Mosaics to be found in Scotland this year. Two of the Forum's speakers are Christopher Smith who worked with Paolozzi in the 1980s in creating the mosaics, and Liz Laumenech, Public Arts Officer at the University of Edinburgh, who will talk about future plans for the salvaged work. Others include: Dugald MacInnes, Scottish slate mosaicist, the London based artist Emma Biggs who played a key role in reviving the art of mosaics in the 1980s, and American mosaic artist and writer Lilian Sizemore. The weekend will also include a day of workshops and an Exhibition of Contemporary Mosaic, the first of it's kind to be held in Scotland for more than ten years at Patriothall Gallery, Stockbridge, from September 23rd to October 1st, showcasing the wonderful diversity of this inventive and fascinating artform." Kate Anderson has exhibited her work both nationally and internationally. Her studio near Kirkcudbright has hosted many painting and mosaic courses since 2003 and she has taught in art colleges and educational centres in London, Oxfordshire, Cumbria and Scotland. In 2009 she collaborated with leading world equine painter, Peter Howell, also local to Galloway, on a wall mosaic for the Saratoga Arts Festival, and her research and related writing has appeared in many publications. In 2014 she organised an exhibition of five leading mosaic artists in Scotland including herself. 'Mosaic at the Mill' at the Mill on the Fleet Galleries, Gatehouse of Fleet, showcased the diversity and originality of the best of Scottish mosaic art.